Untwisting Tiny Feet: Treating Clubfoot | Podiatry Associates, P.C. ?What are the dangers of leaving clubfoot untreated? ?Is it okay for my child to wear used shoes? ?Do my child's flat feet need to be treated? A kiss, a bandage, a loving hug – these are ways parents “make it all better” when a child is hurt or has a problem. There are some things in life, however, that unfortunately can’t be fixed so easily. When babies are born with clubfoot, parents understandably want to know immediately what can be done to fix the problem – and that’s great! 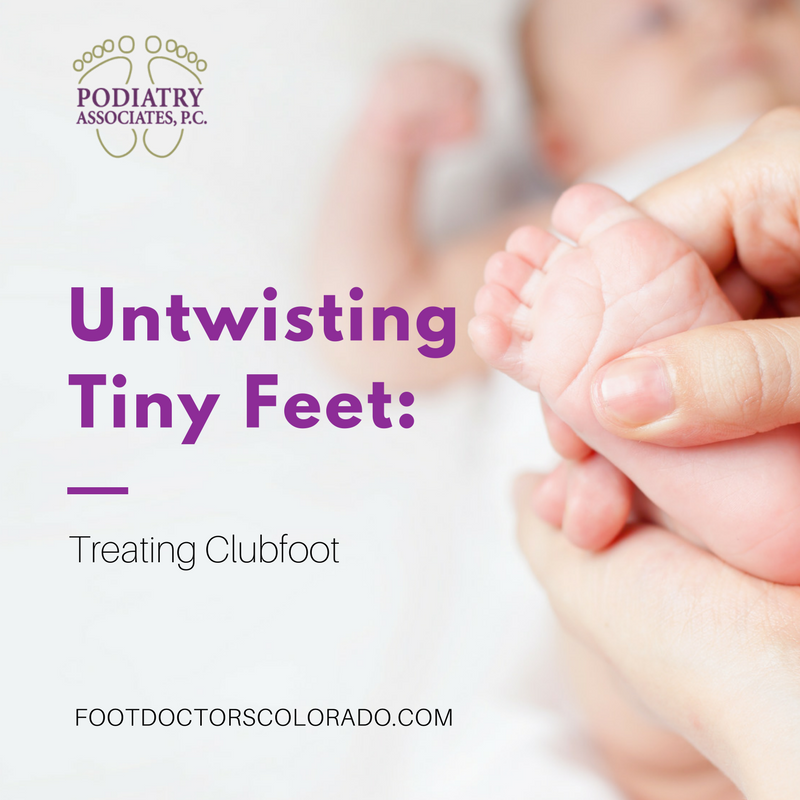 The earlier we begin the process of untwisting tiny feet, the better the chances are that treatment will be successful -- and the sooner your child’s feet will be straightened and functioning just like any other child’s. While it may not be as simple as a kiss or hug, treating clubfoot typically involves conservative measures only, although the process does takes patience and time. The good news is that your baby’ twisted feet are not causing any discomfort, and neither will the process of straightening them. It’s best to start within the first or second week of birth when tiny bones and soft tissues are most malleable. We will slowly stretch and turn the feet, manipulating them into proper position a little bit at a time. After each manipulation, we will cast the feet to hold them in place. This process will then repeat for several months – turn, cast, turn, cast -- until feet are in correct alignment and facing the right way. Special shoes, stretches, and sometimes braces can help to keep feet in position once the process is complete. There are occasions when surgical procedures may be necessary to lengthen short Achilles tendons, or fuse or pin bones together to ensure they stay put, but by the time your child takes that milestone first step, the untwisting of tiny feet will be complete!